A couple of weekends ago, Sara and I got together online to bake this month's Bread Baking Babe bread, The Rosendal Crisp Bread. This bread was built around a rye sourdough starter. Not wanting another starter living our fridges, both Sara and I took our own wheat sourdough starters to rye starters by over a few days changing up the flour we fed them. Larry got the call up from my starter line up for me as Moe and Curly have both been baked with in the past couple of weeks and Craterface found himself out on the counter over at Sara's. One of the curses or benefits, depending on how you look at it, of working with starters is after you power feed them in preparation to bake with them you always have extra. If you plan ahead, you can use that toss off to bake other goodies or make pancakes for dinner because the toss off is just as active the part of the starter you use to bake. Unfortunately, on the day that Sara and I got together I wasn't really thinking about using the toss off so I had no plan, and that lack of planning turned out to be the best stroke of baking luck I've had in quite a while. It was while I was pondering what to do with the toss off that I also began to think about all the small amounts of various rye and wheat flours I had tucked away in the freezer. 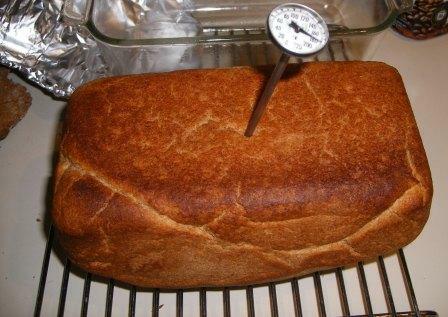 Doing some quick calculations in my head and a little math on a scratch piece of paper, I figured that Sara and I had enough toss off starter left over from our Crisp Bread to make a very good sized loaf of sandwich bread based around rye flour and whole wheat bread flour. A quick query and I had a partner in crime. That is what I love so much about Sara, she is always game to try one of my crazy, on the fly, off the cuff bread recipes. and then built a nice firm but slightly tacky dough from the sponge. and I basted the top of mine with some melted butter before popping it into the oven for about 40 minutes. Another caveat about working with rye, wheat or mulit-grain flours, is that the baking times are longer and the final internal temperature is normally a bit higher than with white flour breads. I like to get my rye, wheat and mulit-grain flour breads up around 190 - 200 degrees internally. This sometimes means having to tent the bread to prevent it from over browning. Finally, the last thing we had to do was wait for the bread to completely cool before slicing into the bread. If you slice into rye based breads before they cool completely you end up with a gummy loaf of bread. So, what did our taste testers think of our "Wing It Bread"? My bread was taken into the office and pretty much had disappeared by noon. I heard that there were fisticuffs over the loaf heel in Sara's house with Scott ending up the winner. If you ask me, Sara ended up the winner because she had the most incredible spread on her slash. And we both ended up with a keeper of a recipe. Don't you just love accidental recipe success? Both of us enjoyed this so much, I'm submitting the Wing It Rye Whole Wheat Sandwich Loaf to Susan of Wild Yeast for this week's edition of "Yeast Spotting". Stir in flours, holding back the reserved 1/4 cup of AP/bread flour, and salt to sponge to form firm but tacky dough. 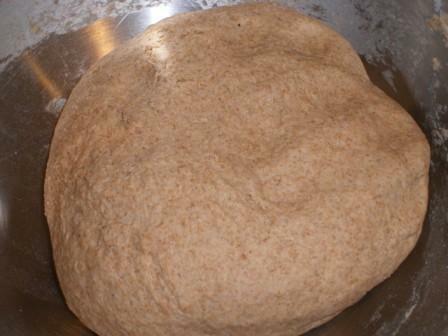 Add reserved flour if dough is too soft and does not form a dough ball. Knead until dough is springy about 7 minutes or so in a stand mixer. Let rest for 10 minutes and then knead by hand for about 2 - 4 minutes. Dough will be tacky but not clumpy sticking to your hand. 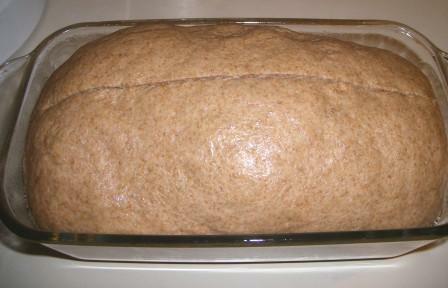 Form into loaf and place in prepared large loaf pan. Cover and let rise until loaf is about 1" over edge of loaf pan. If you want, split top with sharp knife/razor blade and brush melted butter on top. Bake at 375 for 40 minutes or until inside is about 200 degrees. Let cool completely, about 2 - 4 hours, before slicing. Note about this recipe: You will need to already have an active sourdough starter. You can find a recipe for a sourdough starter here. Feed the other half 1/2 cup flour and 1/2 cup water, let sit on counter for 4 hours until bubbly. Divide into half. Use one half to make pancakes, muffins, etc and feed the other half 1/4 cup rye flour, 1/4 cup AP flour and 1/2 cup water. 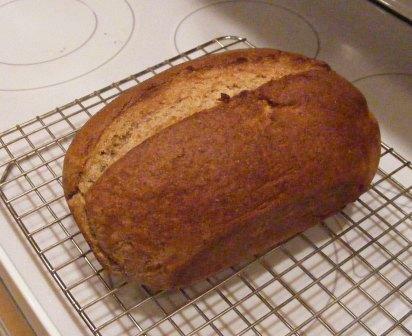 Let sit for 8 hours and feed again 1/4 cup rye, 1/4 cup AP flour and 1/2 cup water and let sit overnight on counter. 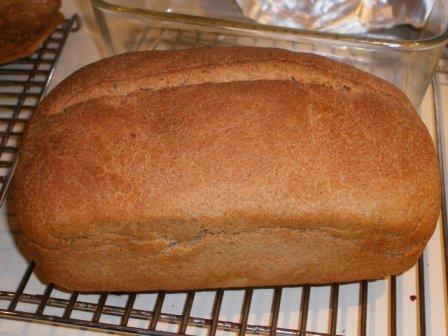 Next morning, feed 1/2 cup rye flour and 1/2 cup water. Let ferment for 24 hours. Divide in 2 (toss off 1/2 or make some dark onion rye - ha!) 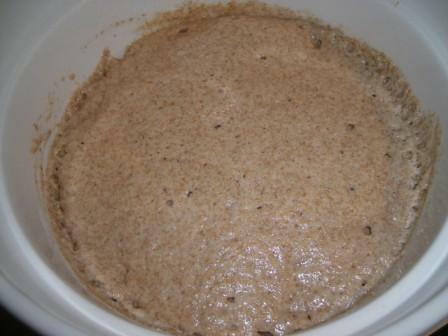 and feed other half 1/2 cup rye and 1/2 cup water. Wait 8 hours, stir up and use or you can put in fridge until ready to use. If you put it in the fridge, let it come to room temperature and stir in any hooch before you make the Wing It Sandwich loaf.